Pitched percussion: A glockenspiel and a set of crotales in use. Pitched percussion, consisting of pitched instruments such as glockenspiel and tubular bells. This subsection is traditionally called tuned percussion, however the corresponding term untuned percussion is avoided in modern organology in favour of the term unpitched percussion, so the instruments of this subsection are similarly termed pitched percussion. All instruments of this subsection are pitched, and with the exception of the timpani, all pitched instruments of the percussion section are in this subsection. All mallet percussion instruments, and keyboard percussion instruments such as the xylophone and tubular bells. Collections of pitched instruments such as hand bells, tuned cowbells and crotales. Most other melodic percussion instruments. Despite the name, keyboard percussion instruments do not have keyboards as such. Keyboard instruments such as the celesta and keyboard glockenspiel are not included in the percussion section owing to the very different skills required to play them, but instead are grouped in the keyboard section with instruments that require similar skills. 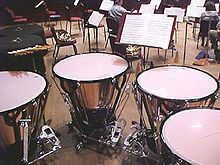 Similarly, the timpani, although they are pitched percussion and are tuned by the player, are not included in the tuned percussion subsection owing to the particular skills expected of the player. All unpitched percussion instruments are grouped into the auxiliary percussion subsection, which includes an enormous variety of instruments, including drums, cymbals, bells, shakers, whistles and even found objects. Players are expected to be accomplished on the snare drum, bass drum, clash cymbals and other hand percussion, and to be able to adapt these skills to playing other instruments and even objects, for example the typewriter. The timpanist is a specialist who does not usually perform on the other percussion instruments during a concert. A high level of skill unique to this instrument is expected. While players of tuned and auxiliary percussion often play many instruments from both subsections during a performance or piece, the timpanist is normally dedicated to that instrument. This page was last edited on 2 October 2018, at 06:06 (UTC).